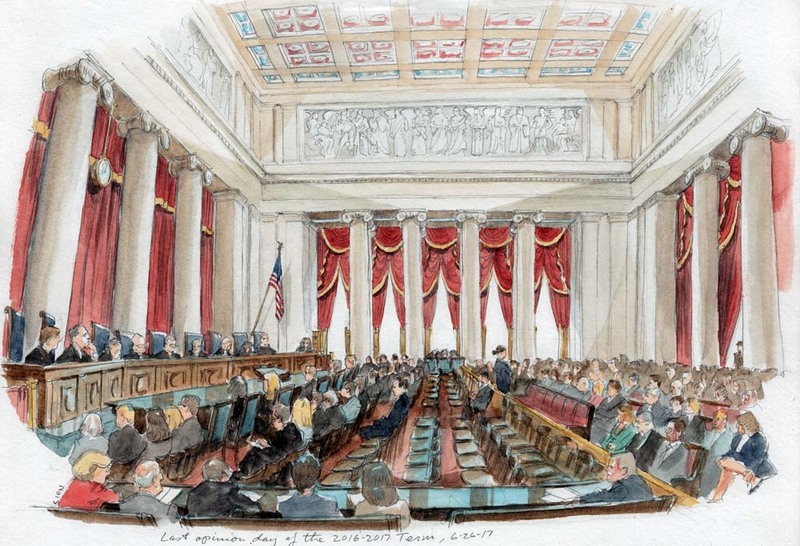 How does one become a Supreme Court sketch artist? How did you get to where you are today? Oh my. Really, I kind of fell into it. I went to the Maryland Institute College of Art and after graduating I was rehabbing houses. Then our governor in Maryland was going on trial, so I tried out to be a sketch artist for a local station in Baltimore, and that worked out. After that trial, there was a lot of work for sketch artists in D.C. because there were no cameras in the Senate, or in the House, either. So, I wrote letters to the three networks, and CBS responded. My first day I went to the Supreme Court in the morning and the Senate in the afternoon and was just totally overwhelmed. But that was my beginning, and I think that was in 1976. Sometime later in 1980 I got a contract with NBC, and I’ve been under contract with them pretty much ever since. But, really, for years I just didn’t have a clue what was going on. The first time I went into a courtroom, and they said, “Oyez, oyez!” I thought they were saying, “Oy vey, oy vey!” I was very ignorant. But little by little, things started to sink in, and nowadays I follow the cases I’m sketching. 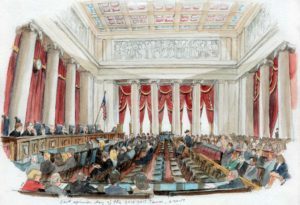 Can you walk me through what a day at the Supreme Court is like for you? A wonderful thing has happened in the last few years, and that’s SCOTUSblog. I started working for them, and it’s been great. I really love doing their banner. So on an average day I get to court early, and sometimes I’ll sketch the line outside the court, or maybe the line of bar members inside downstairs in the courthouse. I love turning out that little banner sketch because it’s such a rush to draw it and scan it and upload it. By then it’s about 9:30, and it’s time to rush upstairs. I’ll sketch one or two arguments in a day, and afterwards I come downstairs to finish up. I usually sketch upstairs just in pencil and then I add the color when I get back down to the press room. Then scan and upload. You are one of the few people who gets to depict what’s actually happening, what people are actually seeing in the courtroom — do you think that there’s more to be done in terms of showing that to the public? I think it’s inevitable that cameras are going to get in the courtroom, and I think in many ways it’s a very good thing. But I also think that when you have something on camera you accept it as being the truth — and it’s not really the whole story. A justice may say something from the bench that doesn’t really reflect what they’re thinking — they’re just saying it. But I don’t know, it’s hard to argue against total openness, and anyone who wants to see the proceedings should be able to. 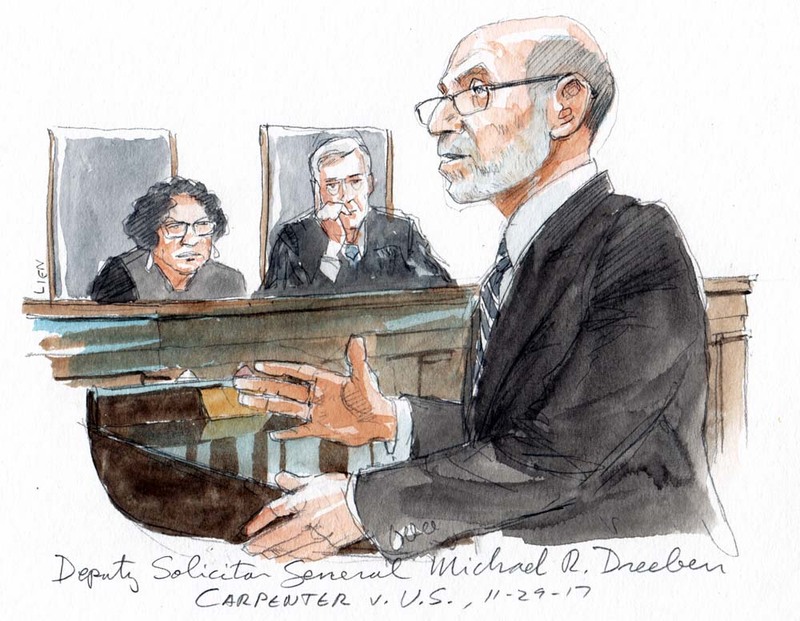 How do you view your role as a court artist? Is there anything you’re hoping to accomplish with your sketches? I’m hoping to make a record. It’s the only visual record in many cases, and I’m trying to not inject myself into it at all. It’s hard because you have to be objective but in a way, you’re drawing from memory — you’re observing and then you’re drawing. You’re sort of shrinking time. Do your sketches of justices evolve over time as you get to know them more and familiarize yourself with their personality and demeanor? Absolutely, yes. The longer I look at them, the more I start to pick up on things I didn’t see before. Right now, I’m struggling with Gorsuch, and of course he’s all the way down at the other end of the bench. He’s kind of easy because he’s got that long, long face, but I know that when we get another justice and he ends up on my end of the bench I can look at him more closely and see him much better. Do you have a favorite justice to sketch? I’ll tell you who’s the easiest, and that is Justice Sotomayor. Plus, with her glasses now that makes her really easy. And she’s got the hair — it’s a cinch. I really enjoy sketching Breyer as well because his hands are all over the place, and I’m very good at drawing hands. No, they’re not too hard to do. But it is the thing I think about first when they walk out. Because once she sits down, I don’t really see her very well. I see the top two-thirds of her head, but I don’t see the jabot anymore. So I really have to make sure to take a look, otherwise I have to wait until the end of arguments when she stands up. Is there any sketch in particular that you cherish the most? What I really like right now are those banner sketches I do — I think I’m looser when I do those. I feel like I have more artistic freedom. The first one that I did that was a departure from the sketch of people in line was for the Yates argument in which a fisherman was prosecuted because he dumped his catch and destroyed his evidence. The idea occurred to me while I was walking to court that morning of drawing the justices dressed as fishermen and that was sort of the beginning of all that.